Other reasons against a mandatory helmet law are all just different faces of this same idea. Claiming that a helmet law increases the “size” of government is just a general policy of letting people make decisions on their own… like whether to wear a helmet or not. To date, NH motorcycle riders have prevailed in preventing the legislature from imposing a mandatory helmet law. Unfortunately, according to those seeking to mandate helmet laws, there is a cost to having motorcyclists getting hurt on the roads of New Hampshire because they were not wearing a helmet. That cost comes in the form of medical expenses and the loss of employment and income that helmetless victims suffer when they are seriously hurt or killed in a crash. Supporters of a helmet law point out that many of these costs are not paid by the injured biker. If the biker is either uninsured or benefiting from a governmentally subsidized insurance like ObamaCare or Medicare, then their medical costs are actually defrayed among all of New Hampshire’s taxpayers. Even if the motorcyclist has his or her own private insurance coverage, the increased risk that bikers in New Hampshire face because of the lack of a mandatory helmet law makes it more expensive to maintain that coverage. As a result, all motorcyclists—not just bikers who refuse to wear a helmet—pay the increased cost that comes with living in a state that lets riders choose whether to wear a helmet or not. Finally, because there is the misconception that requiring motorcyclists to wear a helmet is nothing more than government telling people what to do, politicians have not been able to muster a majority vote by supporting a helmet bill. The NH motorcycle injury lawyers at Tenn And Tenn, P.A. are long time motorcycle riders and personal injury lawyers. 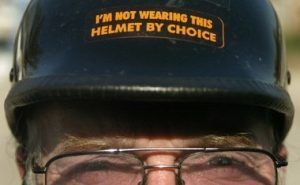 We understand the arguments advanced by those in favor of, and against a helmet law. Statistically, helmets save lives. However, until the legislature makes them mandatory for all riders, we know that many will opt out of wearing them. For more than 25 years we have represent people hurt in motorcycle accidents in New Hampshire. Contact us online or call us at (888) 511-1010.